Results 1 - 15 of 20 for "Yaxchilán"
Caption: JM01500, Lintel 8, Detail of Right Area., Dimensions unavailable. Category: Maya, Late Classic Period. (9.16.4.1.1, 7 Imix 14 Sek), 9 May AD 755. 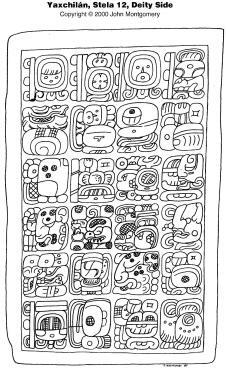 Keywords: Limestone, Ruler/ahaw Bird Jaguar, Yaxun Balam, prisoner, Jeweled Skull, capture, spear, war, warfare, warrior, Tlaloc headdress, feathers, earflare, cape, pectoral, bib, loincloth, trophy head & celt assemblage, kneebands, sandals, skull, Hieroglyphs, u bak, "his prisoner", name of Bird Jaguar, Yaxchilán Emblem Glyph, name of Jeweled Skull. Caption: JM01515, Lintel 15, Detail, Vision Serpent., Dimensions unavailable. Category: Maya, Late Classic Period. (9.16.3.16.19, 4 Kawak 12 Sip), 28 March AD 755. Keywords: Limestone, Blood scroll, maize foliage, autosacrifice, sacrificial bowl, blood-splattered paper, portrait of founder (?). 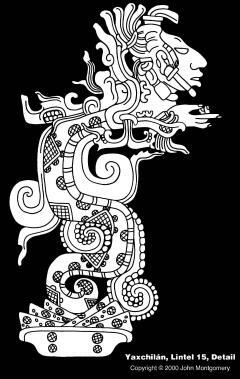 Caption: JM01516, Lintel 16., Dimensions of sculptured area: 70 cm H. X 60 cm W.
Category: Maya, Late Classic. (9.16.0.13.17) 6 Kaban 5 Pop, 10 Feb 752. 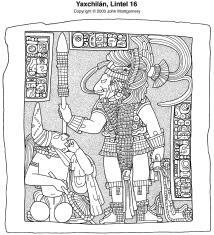 Keywords: Limestone, Ruler/ahaw Bird Jaguar, Yaxun Balam, feather headdress, bib, jerkin, belt, loincloth, wristlets, anklets, sandals, prisoner, conical cap, rope bindings, fan (? 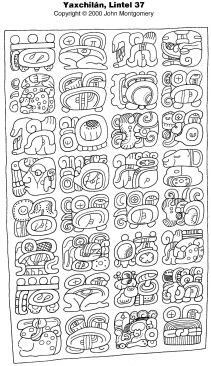 ), spear, shield, war, warfare, warrior, blood drops, Hieroglyphs, Calendar Round, 6 Kaban 5 Pop, chukah, capture, u sahal, numbered k'atun, name of Bird Jaguar, Yaxchilán Emblem Glyph. Caption: JM01524, Lintel 24., Dimensions of sculptured area: 104 cm H. X 74 cm W.
Category: Maya, Late Classic. (9.13.17.15.12) 5 Eb 15 Mak, 28 Oct AD 709. Keywords: Limestone, Ruler/ahaw Shield Jaguar, Lady Xok, Na Xok, feather headdress, human head, earflare, nosebead, cape, belt, loincloth, wristlets, legbands, sandals, jaguar pelt, brocaded robe, Tlaloc headdress, rope, thorns, torch, blood drops, sacrificial bowl/basket, blood-spattered paper, necklace, sun god medallion, AO Mexican Year Sign, bloodletting, autosacrifice, fire, smoke, Hieroglyphs, Calendar Round, 5 Eb 15 Mak, u ch'ab, numbered k'atun title, name of Shield Jaguar, captor of, Ah Nik, Yaxchilán Emblem Glyph, artist's signature, Ah Chak Ah Hol, saturn/Jupiter hieraphony. Caption: JM01525, Lintel 24, Detail, Upper Area of Lady Xok., Dimensions Unknown. Category: Maya, Late Classic. (9.13.17.15.12, 5 Eb 15 Mak), 28 Oct AD 709. 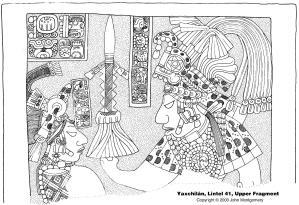 Keywords: Limestone, Lady Xok, Na Xok, Tlaloc headdress, turban, brocaded robe, rope, thorns, blood drops, blood scrolls, necklace, sun god medallion, AO Mexican Year Sign, bloodletting, autosacrifice. 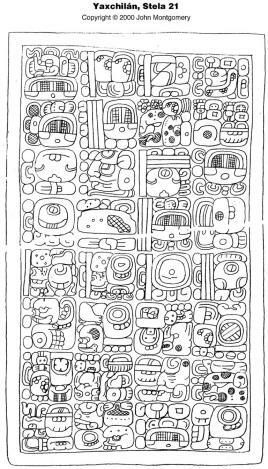 Caption: JM01537, Lintel 37., Dimensions of Sculptured Area: 93 cm H. X 57 cm W.
Category: Maya, Early Classic Period. (ca. 9.5.0.0.0, 11 Ahaw 8 Sek), 5 July AD 534. Keywords: Limestone, Hieroglyphs, 8th Successor, 9th Successor, Calendar Round, 1 Kawak 7 Yaxk'in, name of Ruler 2 of Piedras negras, name of Bird Jaguar I, name of Knot-Eyed Jaguar, Bonampak-Emblem Glyph, name of Great Jaguar Paw I, Chak Toh Ich'ak I, Chak Mol I, Tikal Emblem Glyph. Caption: JM01541, Lintel 41., Dimensions of Sculptured Area: about 55 cm H. X 84 cm W.
Category: Maya, Late Classic Period. (9.16.4.1.1) 7 Imix 14 Sek, 9 May AD 755. 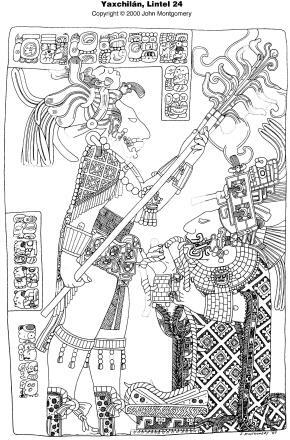 Keywords: Limestone, Ruler/ahaw Bird jaguar, Yaxun Balam, female figure, Lady Wak, Tlaloc headdress, feathers, jaguar pelt, cape, bib, jaguar medallion, earflare, belt, wristletrope, brocaded robe, spear, war, warfare, warrior, Hieroglyphs, Calendar Round, 7 Imix 14 Sek, star-shell verb, war, chukah, capture of, name of prisoner Jeweled Skull, name of Bird Jaguar, Yaxun balam, numbered k'atun title, name of Lady Wak, lady 6, Ik Site Emblem Glyph, Lady Bakab. Caption: JM01548, Lintel 48., Dimensions of Sculptured Area: 98 cm H. X 55 cm W.
Category: Maya, Early Classic Period. 13 Feb AD 526. Keywords: Limestone. Hieroglyphs, Initial Series, 9.4.11.8.16, 2 Kib 19 Pax. Caption: JM01600, Stela 11, back., Dimensions unavailable. Category: Maya, Late Classic Period. (9.15.19.1.1) 1 Imix 19 Xul, June 4 AD 526. 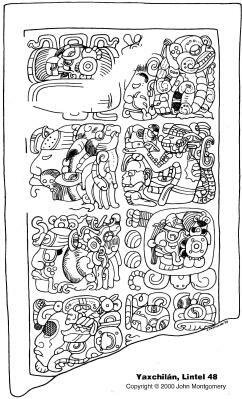 Keywords: Limestone, Ruler/ahaw Bird Jaguar IV, Yaxun Balam, mother and father in ancestor position, three prisoners, zoomorphic headdress, shell diadem, earflare, necklace, robe, pectoral, Chak Chib Chak, mask, Manikin Scepter, God K, K'awil, belt, Wits Monster, skirt, loincloth, jaguar pelt, rope, blood drops, baton, blood scrolls, blood-knots, cape, belt, sandals, shell, Hieroglyphs, Calendar Round, 1 Imix 19 Xul, numbered katun title, name of Yaxun Balam, uchan, name of prisoner Ah Uk, Yaxchilán Emblem Glyph, bakab, kalomte, "child of mother", Lady Evening Star, "child of father", Shield Jaguar. Caption: JM01601, Stela 11, Front, Lower Panel., Dimensions unavailable. Category: Maya, Late Classic Period. 3 May AD 752. Keywords: Limestone, Hieroglyphs, Initial Series, 9.16.1.0.0, 13 Ahaw 8 Sek, accession Bird jaguar, Yaxun Balam, numbered katun title, kalomte, Yaxchilán Emblem Glyphs, "child of mother", Lady Evening Star, "child of father", Shield Jaguar, bakab, captor of, name of prisoner Ah Nik. Caption: JM01602, Stela 12, Deity Side., Dimensions unavailable. Category: Maya, Late Classic Period. (9.16.1.0.0) 11 Ahaw 8 Sek, 3 May AD 752. Keywords: Limestone, Hieroglyphs, Calendar Round, 6 Ix 12 Yaxk'in, 6 Ahaw 8 Sek, death, u chay, u sak nik nal, ch'ahom, numbered katun title, name of Shield Jaguar, captor of, Ah Nik, Distance Number, seating glyph, accession, Yaxun Balam, Yaxchilán Emblem Glyphs, bakab. 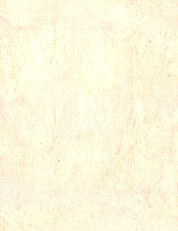 Caption: JM01603, Stela 21., Dimensions unavailable. Category: Maya, Late Classic Period. (9.16.1.0.9) 7 Muluk 17 Sek, 12 May AD 752. Keywords: Limestone, Hieroglyphs, Initial Series, 9.0.19.2.4, 2 Kib 2 Yax, house dedication, 7th Successor, name of Yaxchilán founder, Yaxchilán Emblem Glyph, Distance Number, Calendar Round, 7 Muluk 17 Sek, dedication, name of Bird Jaguar IV, Yaxun Balam IV, numbered k'atun title. 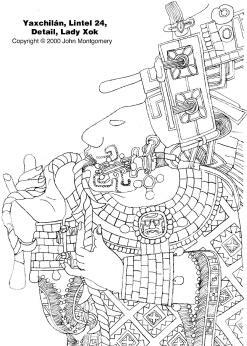 Caption: JM01604, Hieroglyphic Stairway 2, Step VII., Dimensions of sculptured area: 35 cm H. X 153 cm W.
Category: Maya, Late Classic Period. 21 Oct AD 744. Keywords: Limestone, Ball player, Bird Jaguar IV, Yaxun Balam IV, 2 dwarves, fish headdress, chest protector, earflare, knee protector, bead skirt, sandals, ball, bound prisoner, Venus sign, shell earflare, wristlets, anklets, necklace, long-necked bird, Hieroglyphs, Calendar Round, 13 Manik 5 Pax, 9 Kan 12 Xul, 1 Ahaw 13 Xul, decapitation, Distance Number, ball court glyph, extended Long Count, 9.15.13.6.9, 3 Muluk 17 Mak, name of Bird Jaguar IV, Yaxun Balam IV, numbered k'atun title, Yaxchilán Emblem Glyphs, bakab. Caption: JM03426, Emblem Glyphs., Dimensions unavailable. Both Yaxchilán. Caption: JM03474, Initial Series and Supplementary Series., Dimensions unavailable. 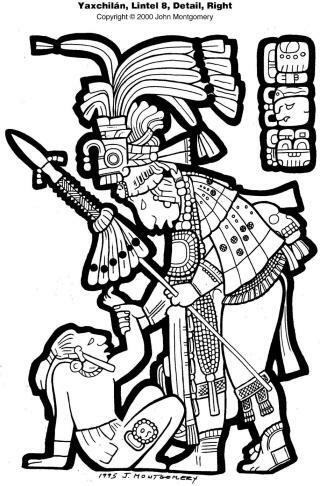 Category: Maya, Early Classic Period. 9.0.19.2.4, 2 Kan 2 Yax, 16 Oct AD 454.